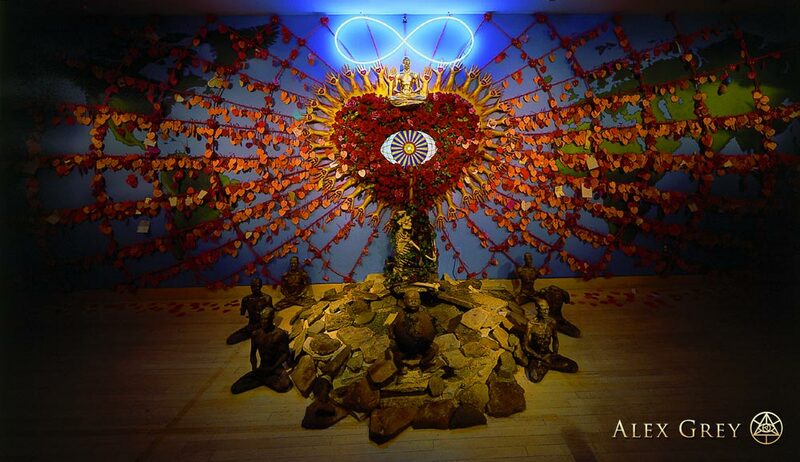 paint, rope, silk, roses, gold, neon, rocks, skeletons, stained glass, and soil, 10 X 60 X 8 ft.
Allyson and I created an alchemical healing piece called Heart Net at the American Visionary Art Museum in 1998. On a 60-foot-long painted map of the world, a red rope web radiated from a gigantic heart composed of hundreds of silk roses. A stained-glass eye in the heart cried continuously into a small stone grotto surrounded by broken buddhas. Under the heart a black and a white skeleton embraced and an earth child crawled out of the grotto. 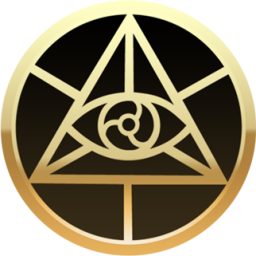 Above the heart was a golden buddha, and above the buddha was a white neon infinity symbol, and above the neon was a tiny naked embracing Ati-Buddha sculpture. The Heart Net was an audience participatory piece that invited people to write a healing prayer or loving message on a small paper heart and tie it to the rope net. The Heart Net had thousands of prayers and messages on it, and it was really moving to read some of them. Everything from cynical dirty limericks to children scrawling love notes to their mommies to people expressing passionate and spiritual regard for each other and the planet. Different areas on the world map elicited specific prayers in the native languages of those nations. The piece was meant to spread a subtle field of healing good wishes over out broken world.